As compared to spinning reels, baitcasters have some built in advantages. 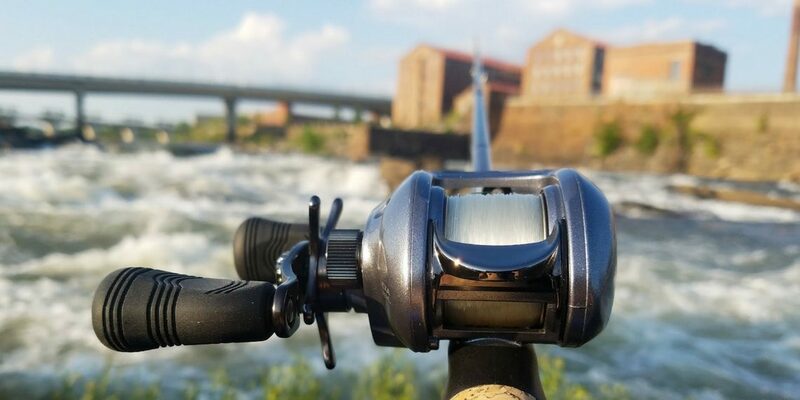 Typically you can be much more accurate with a baitcaster reel, allowing you to negotiate technical areas with more rocks or vegetation to get hung up on. Baitcasters also generally lend a little bit more distance to your casting potential, because the line is coming out straighter, and not in a circular motion (especially if you’re fishing with lures). On the flip side although, casting reels are also subject to a nasty little thing called “backlash.” This is what happens when your lure has already hit the water, but your thumb is still on the button, so it’s still coming out of the reel. This creates a really messy “bird’s nest” of fishing line that can be a major headache (if not altogether impossible) to sort out. Having the right fishing line can go a long way to helping you cast further, improve accuracy, and avoid backlash (plus the headache of sorting out tangles and knots). Though people fish all 3 kinds of fishing line with baitcasters, we’ve found that the best fishing line for a bass baitcaster is monofilament. Due to its lack of line resistance, and optimal weight, monofilament fishing line is much less prone to backlash and bird’s nesting. Braided line can be fished through a baitcaster, but is more likely to develop line resistance. Flourocarbon line is the most difficult of all, and should really only be used through a baitcaster by the most experienced anglers. One of the important things to realize about baitcast reels is that they were not designed for light line. A larger diameter, heavier line, will come out of the reel more easily and true. We recommend that you use 10 pound line and above. If you’re a beginner, 17 is ideal. Even if you are fishing for smaller, lighter bass, this added line weight will have a truer release, and give you an easier time fighting backlash. For our money, it doesn’t get any better than the Berkley Trilene XL Mono. This line is durable and extremely smooth. It lends itself to no hassle casting, with very little backlashing (when casted properly). It has very little line “memory”, so you can usually use and store the line on your reel for months without it needing to be replaced. It also has great sensitivity and very high strength. This gives it a lot of versatility, and allows you to fish a wide variety of lures and baits. One of the things that people like most about the Trilene XL is it’s ability to “punch above its weight.” You’ll find lots of people that are able to hook and land larger fish on a smaller test (i.e. 8 pound fish on a 4 pound line). All in all, an incredible choice for your bass baitcaster line. We recommend the 10, 12, or 14 pound test.